Photo credit: Gold Mountain Coffee Growers (@goldmtncoffee) Roaster Karl Fisher of Alabaster Coffee in Williamsport, Pennsylvania visits partner producers of Gold Mountain Coffee Growers in Nicaragua. Here Karl stands with Sebastiana Diaz Ortiz on her farm. He traveled through a river, past men with large guns, and over mountains to get there. 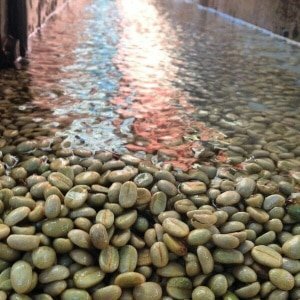 Roasters in the third-wave of coffee need a direct-trade supply chain that values quality and traceability. Below are five key steps they should take to ensure both. Unfortunately, the C Market and certifications of coffee farms create incentives for volume, but not quality. Why should a coffee farmer who gets paid $1.15/lb most years ($2.00/lb once every blue moon) pick with perfect ripeness, ferment well, wash coffee well, and pick out imperfections on raised beds when her pay barely lets her family eat? Certification systems may have “premiums” tied to volume, but they are often consumed by administrative fees and export fees. 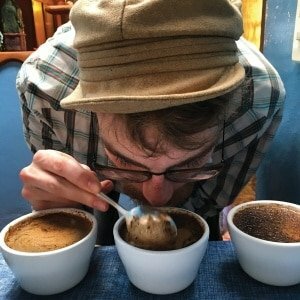 Unless farmers are connected directly to specialty markets that place value on quality, their main incentive will be volume, not high-cupping coffee. Photo credit: Gold Mountain Coffee Growers (@goldmtncoffee) On Finca Idealista in Nicaragua the farm utilizes volcanic filters to clean water after it is used to wash coffee. This prevents environmental contamination. The farm also bought a rainforest just to protect it and was awarded the 2016 excellence award for sustainability by the Specialty Coffee Association of Europe. Photo credit: Gold Mountain Coffee Growers (@goldmtncoffee) Farmers in direct-trade relationships based on quality have incentives to produce meticulously-processed coffee. 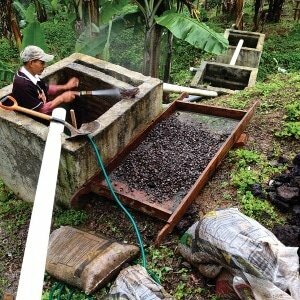 Here coffee is being washed on Finca Idealista in Nicaragua. Photo credit: Gold Mountain Coffee Growers (@goldmtncoffee) Coffee Roaster Eric Mason sources coffees in Nicaragua with Gold Mountain Coffee Growers. Third-wave roasters wishing to obtain high-cupping coffees nowadays need to seek out direct-trade relationships. Increasingly-educated customers and “foodies” in the globalized world (think of the local movement in “Portlandia”) expect roasters to know their coffee farmers and the processes used to produce their coffee. They expect traceability, not a certifier’s generic stamp. News articles are shedding considerable light on gaping flaws in certified coffee supply chains, and roasters can do much better. 1) Be there: Travel to origin and cup coffees, then return as the coffee is being packed for export. To avoid coffee switching, take samples yourself from the actual export bags. Roast and cup them. Mark the bags destined for your roastery and watch as they are sealed. Send your favorite barista or cupper if you can’t make it. 2) Engage: Make sure the coffee you purchase is traceable to a specific coffee farm. Visit the farmers. If your export and import partner won’t allow you to visit the farm or if they make excuses, the lack of transparency should dissuade you from that business relationship. 3) Reward directly: When your coffee reaches 87 points or more, give the farmers a quality premium directly (in their hands) and make clear that it is because of the quality they achieved. If you are working with multiple farmers, give the highest-cupping coffees the highest quality reward. 4) See for yourself: When you visit a farm, notice its environmental impact. Did the owners chop down forest to plant coffee? Does the farm protect forest? Are there shade trees? A certification isn’t enough. Verifying environmental protection is more meaningful. 5) Get all the info: If you must rely on importers and can’t get to origin yet, ask them tough questions about the farmers and coffee, as well as coffee processing. Does your importer know the family members of producers? Can they tell you the latest goals and challenges of the farm? When did they last visit? Can they call or visit the farmer within a week or two to ask a few questions for you? Can you visit whenever you’d like? If any of these answers is no, you should look for a more direct connection with origin. Ben Weiner is the founder/CEO/chief farmer of Gold Mountain Coffee Growers, LLC. He is a recognized speaker at the SCA show in Seattle (April 2017) on how to achieve quality through direct trade relationships. You can learn more about coffee processing and get sample roasting tips at www.goldmountaincoffeegrowers.com and see what they’re up to at origin at @goldmtncoffee (Instagram, Twitter, Facebook).